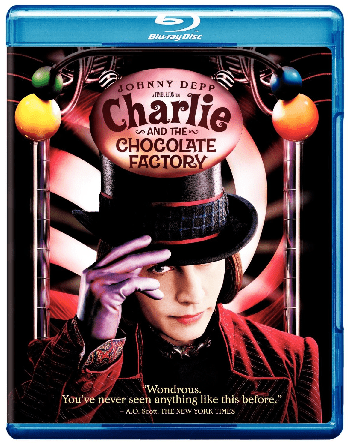 The Charlie and the Chocolate Factory Blu-ray is on sale right now for $5.00 at Amazon. That's 50% off the list price of $9.98! Fantasy Adventure. Acclaimed director Tim Burton brings his vividly imaginative style to the beloved Roald Dahl classic Charlie and the Chocolate Factory, about eccentric chocolatier Willy Wonka (Depp) and Charlie, a good-hearted boy from a poor family who lives in the shadow of Wonka's extraordinary factory. Long isolated from his own family, Wonka launches a worldwide contest to select an heir to his candy empire. Five lucky children, including Charlie, draw golden tickets from Wonka chocolate bars and win a guided tour of the legendary candy-making facility that no outsider has seen in 15 years. Dazzled by one amazing sight after another, Charlie is drawn into Wonka's fantastic world in this astonishing andenduring story.